With the Ixxat CAN-IB 210/XMC and Ixxat CAN-IB 410/PMC, HMS offers two CAN cards that are especially suitable for use in test systems and measurement applications. HMS offers a range of PC/CAN interfaces for PC interface technologies, from plug-in boards to USB, Ethernet, and Bluetooth. Two additional versions for XMC and PMC are now available within the Ixxat CAN-IB plug-in board series, in addition to the established versions for PCI, PCIe, PCIe Mini, and PCIe 104. The XMC and PMC cards offer up to four CAN high-speed channels and support the CAN low-speed (fault tolerant) standard. Furthermore, the cards can also be extended with up to two LIN interfaces. This flexibility is made possible by a concept consisting of piggyback extensions. As an option, all channels are available with galvanic isolation. Both cards feature a 32-bit micro-controller system. This helps with the handling and active filtering of the messages being sent to and received by the card – a feature that comes in handy particularly in applications with high demands for data pre-processing. In addition, the cards are characterized by low latency and maximum reliability, both important points for use in test and measurement systems. All CAN-IB cards are supported by the Ixxat Windows driver packages (VCI) and by the real-time driver packages (ECI for Linux, RTX, Intime, QNX, VxWorks). HMS also offers a Socket CAN driver for use with existing tools under Linux. 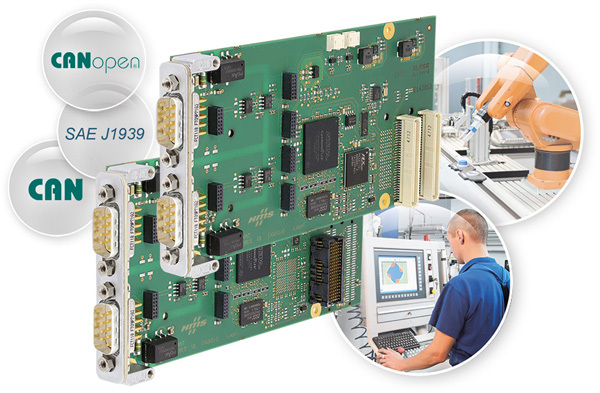 Higher layer protocol applications are supported by the Ixxat APIs for CANopen and J1939. For analysis of CAN and LIN networks, HMS offers the CANanalyser, a Windows-based analysis tool. HMS Industrial Networks is a supplier of products for industrial communication including remote management. The company develops and manufactures solutions for connecting automation devices and systems to industrial networks under the Anybus, Ixxat, and eWON brands. Development and manufacturing take place at the headquarters in Halmstad, Sweden, and in Ravensburg, Germany.